HONOLULU (HawaiiNewsNow) - By Wednesday afternoon the ink had dried on letters of intent, signed by Hawaii's blue chip high school football prospects, all of them sending the 808's most talented to the mainland to play their college football. There were still a few top recruits that had yet to decide heading into National Signing Day, with Kapolei's Myron Tagovailoa-Amosa, Kapaa's Mo Unutoa, Punahou's Miki Suguturaga, and Kahuku's Aliki Vimahi at the top of the list in terms of scholarship offers. Tagovailoa-Amosa signed with Notre Dame, he's the first Hawaii player to do so since 2010. Unutoa, Suguturaga, and Vimahi are all heading to Utah. But, in Manoa more eyes were set on another Red Raider, Kesi Ah-Hoy, who had previously announced that the University of Hawaii was on his short list along with Oregon State. On Wednesday morning Ah-Hoy signed with the Beavers. For the Kahuku senior, Corvallis had been a goal all along because he has multiple family members who have graduated from Oregon State. "It's always been a dream school for me," said Ah-Hoy after putting pen to paper at Kahuku's Signing Day ceremony. "It was my school growing up. I used to go over there and watch their games. So, I've always wanted to be a beaver." Once Oregon State coaches offered Ah-Hoy the opportunity to play on the defensive side of the ball, he says his decision was made. 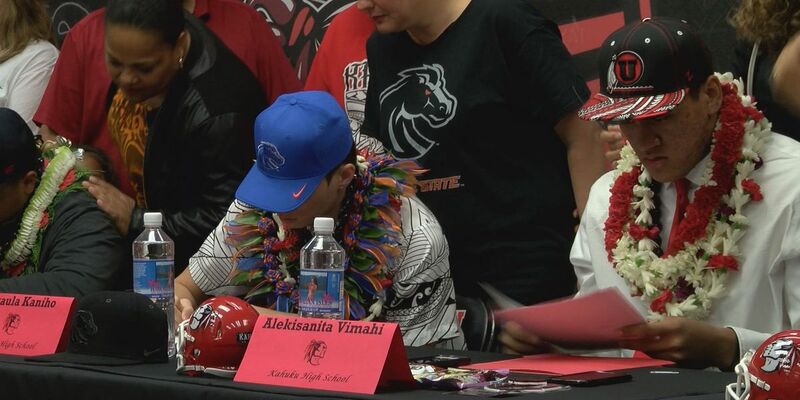 With that, arguably the Rainbow Warriors best shot at signing a local boy was gone. When asked about the local recruiting battle, Nick Rolovich made no excuses. "These kids just signed a scholarship to get a free education to play football and live out a dream. I think that's a tremendous accomplishment," said Rolovich. "It doesn't matter where you go. But, it's something that we've really got to look at. I tell everybody, I don't care if it's one of the 23 we signed... or Tua. You got to go to the best place for you. If that's not UH this year, than that's okay. But, we have to work harder at UH to make that this place for these young men." While his incoming class may not be Hawaii-born, Rolo and the 'Bows did compile a solid group of signees. The Rainbow Warriors will add 23 players from the class of 2017 including six defensive backs, five offensive lineman, four defensive lineman, three wide receivers, two linebackers, two running backs, and one tight end. Seven of those players chose UH over offers from Power Five schools. Rolovich says when it came to this recruiting class he had a clear goal in mind. "We wanted to definitely address the line of scrimmage. If you want to win this conference you better start winning the line of scrimmage," said Rolovich. "You see San Diego State, you see Wyoming make the jump because they can control the line of scrimmage and run the ball. I like the size we got in this group. I like the two different running backs in this group, and defensively we got four to five d-lineman that most of them are young but they're going to be able to compete early."